Sandpiper Publications is a publishing company producing quality Australian, speech, language and literacy resource products for professionals and parents working with children. SANDPIPER is based on the Sunshine Coast in Queensland, and has been producing the resources since 1996. To check out the programs and materials that are currently available, you can look through the Products pages. You can download a catalogue, a product listing and an order form here. You can also select items as you explore the various products that are available, before checking out through the shopping cart. Most of the resources now come as .pdf files that are placed onto a handy USB and mailed out, keeping postage and handling costs down, as well as being super convenient. The Extras section of the website offers some advice around oracy through the questions and answers page, some free downloads for additional book resources, and general information for parents, teachers and speech pathologists. The Services page describes some of the other activities we are involved in such as attending conferences as a trade display, offering school consultations and workshops. Find out about our upcoming events, or send us an email if you are interested in organising a workshop for your school. Please contact us if you have any further enquiries. Thank you. Please check out our growing community. 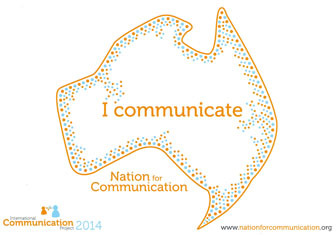 Visit http://www.communication2014.com/ and support the growing awareness of the impact of a communication impairment on people.